Offshore sportsbooks are starting to heat up as more and more online NFL betting players get ready to wager on this upcoming season. Finding the right sportsbook is of extreme importance when betting on NFL games. Today we take a look at Intertops sportsbook, one of the newer but better bookmakers available. Because Intertops sportsbook is relatively young when compared to other leaders in the industry, they are offering some lucrative sign up bonuses to convince online sportsbook players to hop ship. To help bettors understand what kind of sportsbook Intertops is – apart from looking over their sportsbook review let’s take a look at the action they’re offering on this Sunday’s Bengals contest. But before we break down the online NFL betting odds available for this Sunday, let’s find out who the Bengals will be playing this upcoming weekend. 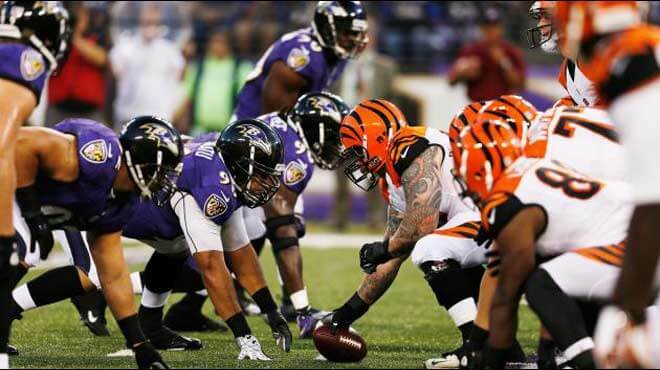 Cincinnati has a pretty tough task in Week 1: taking on one of their AFC North rivals. Neither team is coming off a successful season, so it will be a battle to the death this upcoming Sunday as both teams will be vying for a slight lead in the division. The Bengals need to make the playoffs this season, if only to win their first playoff game in god knows how long. Head coach Marvin Lewis isn’t exactly on the hot seat, but if he keeps making the playoffs just to lose their first game, it won’t be long before the Bengals get fed up and give Lewis the boot – or should I say the paw? Since neither team was great last season, it’s anybody’s guess who will come out on top this Sunday. Let’s find out which team Intertops is favoring. Interestingly enough, the Bengals have received the online sportsbook nod from Intertops. Cincinnati finished the 2016 season with a disappointing 6-9-1 record. Coming off a season in which they won the division, the Bengals were more than ticked off with last year’s 3rd place finish. Obviously Cincinnati failed to qualify for the playoffs with those types of results, but the Bengals did manage to have 5 players qualify for the Pro Bowl. Despite this, no Bengals was picked as an AP All-Pro. The Ravens were hopeful that they could find success in 2016. Whether they did or not depends on your definition of success. Baltimore finished the year with an 8-8 record that pegged them as the 2nd best team in the AFC North. The Ravens had 7 players picked to go to Hawaii and 4 of those were even picked by the AP as All-Pros. Online Sportsbook Predictions to Make: With last year’s failures in mind, it’s difficult to accurately predict who will come out on top. However, this doesn’t mean you shouldn’t bet on this game. Instead, you should take a shot at that totals line.